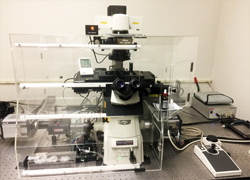 The Nikon TIRF SIM microscope allows the users to do both Total Internal Reflection Microscopy and SIM super-resolution microscopy. The acquisition software is Nikon NIS-Elements. The charge for this instrument is $20/hr. 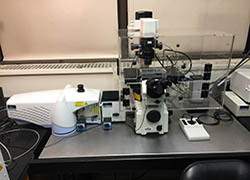 The Nikon A1 Confocal microscope is Nikon's powerful fully-automated confocal imaging system, capable of capturing high-quality confocal images of cells and molecular events at high speed and enhanced sensitivity. The acquisition software is NIS-Elements. The system is located at Belfer Research Building. The charge for this instrument is $15/hr. The UltraView is a spinning disk confocal microscope equipped with five laser lines, which allow visualization of GFP, RFP, CY5, DAPI, CFP, and YFP, etc. 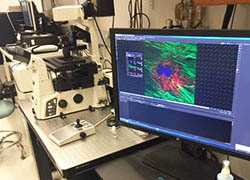 The UltraView ERS system allows for high-speed, multiple-probe, time-lapse experiments; NIS-Elements software is used for image acquisition and analysis. The TCS SP2 Laser Scanning Spectral Confocal Microscope can do measurements of transmitted light, fluorescence and laser scanning fluorescence imaging. The calcium ratio imaging system consists of: a Nikon Eclipse TE 200 inverted epifluorescence microscope, Sutter Lambda 10-2 optical filter system, and Nikon NIS-Elements imaging software with Calcium & FRET plug-in. The system also is equipped with a Narishige micromanipulator system. The charge for this instrument is $10/hr. The charge for this instrument is $5/hr. JEOL JEM-100CX II transmission electron microscope is an advanced high-performance electron microscope with stable and excellent imaging capabilities at low to high magnifications (90X to 800, 000X). A 10M-pixel HAMAMATSU C4742-95 digital camera is integrated into the system for high-resolution image acquisition. 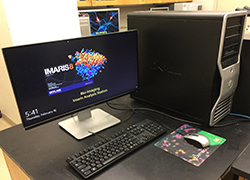 The Imaris Imaging station is a high-power workstation with Bitplane's Imaris Imaging software installed. Imaris provides functionality for the visualization, segmentation, and interpretation of 3D and 4D microscopy datasets. This Imaging workstation is a high-power workstation with Nikon's NIS-Elements Imaging software installed. NIS-Elements provides cutting edges tools for image manipulation and data management. The charge for these instruments is $5/hr. 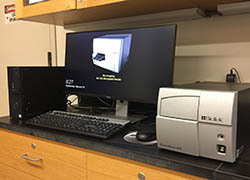 This Imaging workstation has both AutoQuant and Nikon's NIS-Elements Imaging software installed. The charge for this instruments is $10/hr. 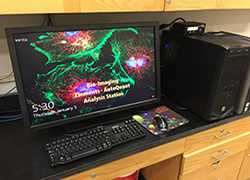 This Imaging workstation has Nikon's NIS-Elements Imaging software installed. Additionally, it has Element's deconvolution module installed. The charge for this instruments is $5/hr. The Molecular Devices SpectraMax Gemini EM Microplate Spectrofluorometer features top and bottom reading optics, dual monochromators, wavelength scanning, well scanning, auto PMT gain and is driven by Softmax Pro software on a Windows-based controller. The charge for this instrument is $5/scan. Typhoon is a highly sensitive variable-mode gel imager. The Typhoon 9410 unites the ability to detect an extensive variety of fluors, with proven storage phosphor autoradiography technology and direct imaging of chemiluminescence. The typhoon can also be used to analyze microarrays. Typhoon FLA 7000 is a fast laser scanner for biomolecular imaging applications including sensitive and quantitative measurements of radioisotopic labels, chemifluorescent Western blots, and single fluorescence. 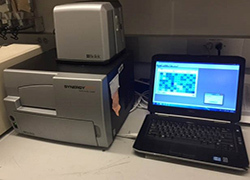 The Odyssey replaces the tradition methods of analyzing western blots, chemiluminescence, and fluorescence detection, with near-infrared (NIR) fluorescence detection. This allows you to quantitate proteins over a much wider linear dynamic range than chemiluminescence can. This feature can enable strong and weak bands on the same blot to be accurately quantified without the need for multiple exposures. In addition, the Odyssey is uniquely equipped with two infrared channels 700 nm and 800 nm, and can thus probe two different targets in the same experiment. PowerWave HT is a multi-channel reader for maximum speed in both 96- and 384-well plate formats. The PowerWave HT provides flexibility for multiple applications, including endpoint, kinetic and spectral scanning mode. Powerful Gen5 PC-based software is used for system control and data analysis. The charge for this instrument is $3/scan. 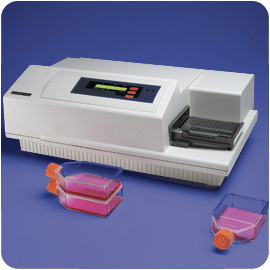 Synergy HTX is a Multi-Mode Microplate Reader for making: absorbance, fluorescence, luminescence and AlphaScreen/AlphaLISA measurements on 6- to 384-well microplates. 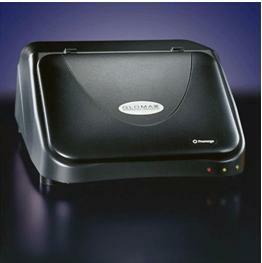 GloMax®-96 Microplate Luminometer The GloMax®-96 Microplate Luminometer is a state-of-the-art Microplate Luminometer with a high sensitivity and broad dynamic range that is necessary for chemiluminescent and bioluminescent applications. The GloMax uses an advanced photon-counting photomultiplier tube (PMT), with a dynamic range of greater than nine logs. This range covers virtually all chemiluminescent and bioluminescent assays, eliminating the need to dilute samples or manage detector-driven gain changes. The Leica CM 3050S Cryostat features motorized sectioning and programmable defrost cycles. The cryostat can cut sections in the range 0.5 to 300 mm. The max specimen size is 55 X 70 mm and can cool samples down to - 50°C. B. Your use of the facility will be recorded. 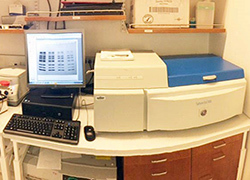 For the optical microscopes and the Gel and Blot scanners, you must obtain a "Gene Center" computer account. This is required to log on to the computers that control the equipment. Your use of the machine will then be automatically logged and you will be charged according to the fee schedule below. C. The facility is available for use 7 X 24. After normal working hours ( 9-5 Mon-Fri ) lock the door when you leave, and access using a key obtained from the facility. D. Training is required before using all machines. 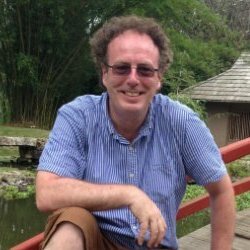 This can be done by individually with the facility manager, or by experienced users in the various CTBR laboratories. For the three confocals, and the Nikon SIM/TIRF you must be trained by the facility managers. Once you have complete the training course your account will be activated for the microscope. E. When using the Cryostat, sign the logbook. K. Equipment is available on a first come first serve basis. 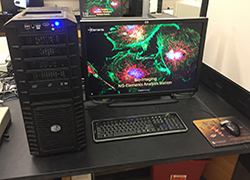 You can book 4 hours slots on the microscopes using the facility's SharePoint Site: https://biosharepoint.hunter.cuny.edu/Bio-Imaging. If you come 30 minutes late you will lose your reservation. You will need a "Gene Center" network account to access the site. L. Users may have no more than 2 reservations made on a calendar at one time for any single machine. For example, Monday 12-4pm, Tues 9-1pm. After Monday's session, the user may schedule another session, thus obtaining another/2nd appointment on the calendar, say Wed 2-5pm. M. Clean oil off the microscope objective lenses after use. O. You must log in to use the equipment using your own Gene Center account. "This project was supported by a Research Centers in Minority Institutions Program grant from the National Institute on Minority Health and Health Disparities (MD007599) of the National Institutes of Health." 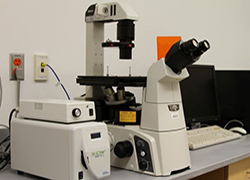 Leica Sp2 Confocal: The facility charges $20 per hour for use of the confocal. There is a $15 minimum charge, and fractions of an hour count as whole hours. 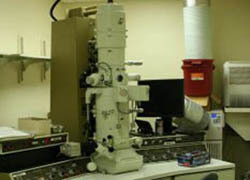 Nikon SIM/TIRF: The facility charges $20 per hour for use of this microscope. There is a $15 minimum charge, and fractions of an hour count as whole hours. 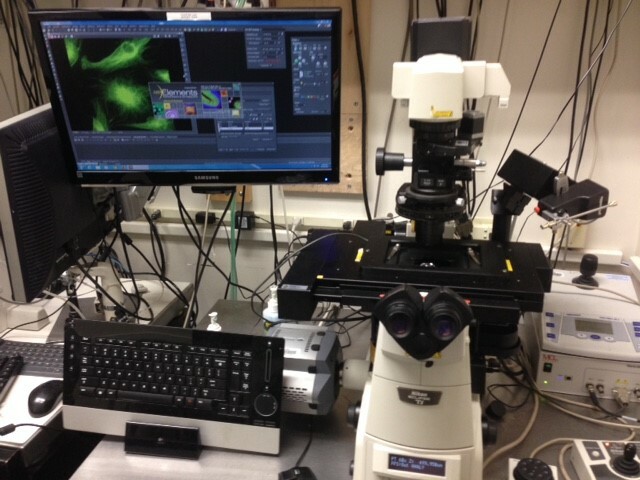 Nikon Eclipse Ti With Ultra High-Speed Wavelength Source: The facility charges $15 per hour for use of this microscope. There is a $15 minimum charge, and fractions of an hour count as whole hours. All Other Nikon Upright & Inverted Microscopes: The facility charges $10 per hour for use of the microscope. There is a $10 minimum charge, and fractions of an hour count as whole hours. 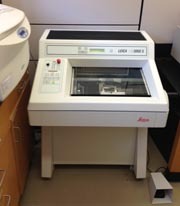 Leica CM 3050S Cryostat: The facility charges $5 per hour for use of the Cryostat. There is a $5 minimum charge, and fractions of an hour count as whole hours. Please sign the log book. 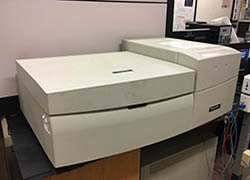 Gemini Spectrophotometer, Typhoon 9410 Imager: The facility charges $5 per scan. Use is monitored by the event log on the computer attached to the machines. PowerWave HT Plate Reader: The facility charges $3 per scan. Use is monitored by the event log on the computer attached to the machines. 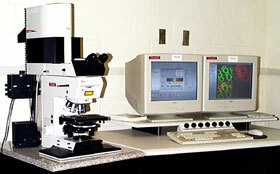 Elements Analysis Workstation: The facility charges $5 per hour for use of this image analysis package. There is a $5 minimum charge, and fractions of an hour count as whole hours. 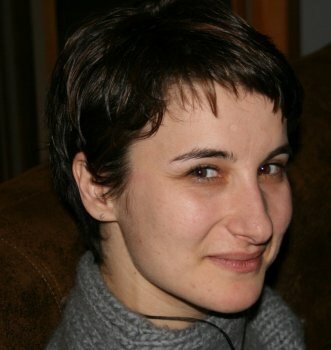 Volocity Analysis Workstation: The facility charges $10 per hour for use of this image analysis package. There is a $10 minimum charge, and fractions of an hour count as whole hours. Imaris Analysis Workstation: The facility charges $10 per hour for use of this image analysis package. There is a $10 minimum charge, and fractions of an hour count as whole hours. (i) Utilize WebEx to setup remote desktop sharing for microscope control. (ii) Utilize PVX monitoring system to setup Internet video conferencing for remote communication purpose. 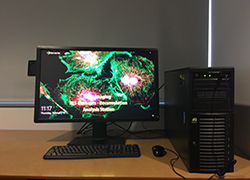 Now a new service is ready for our remote users to get remote access to our advanced confocal microscopes for their own imaging purpose. (iv) PVX video conferencing for real-time consultation: during imaging experiment, PVX video conferencing system is used for real-time conversations between microscope operator and remote users to solve on-site experimental issues. Please check the following link for PVX real-time conferencing: PVX video conferencing operational guide. (v) Cell staining protocol: a simple cell staining protocol is posted here as an example: Sample staining protocol. 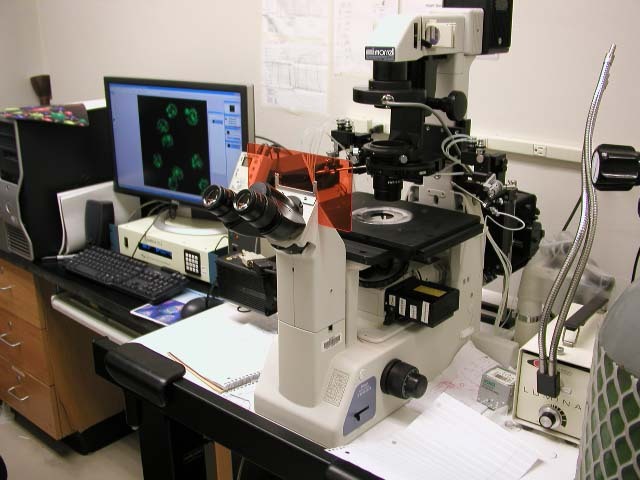 Contact us by email for scheduling a remote microscopic imaging experiment, including, a short description of your experiment, time schedule, sample type, etc. Ship the sample slide or living samples with proper package. A confirmation email will be sent before the experiment date. A WebEx meeting link will be included in this email for remote connection. Nikon A1R Resonant Confocal ( Room Belfer BB 453). The Digital Bio-Imaging Facility is supported by a Research Centers in Minority Institutions Program grant from the National Institute on Minority Health and Health Disparities (MD007599) of the National Institutes of Health.